Rootly News is a simple Zimlet that allows users to view current news headlines from within Zimbra, including the ability to customize the headlines by keyword or category. The news list replaces the calendar area on the main display and is easy to toggle on and off using the right click menu. Users can customize the news they see by choosing from 6 main categories or they can further limit headlines by selecting keywords that must be present in the news article summary or title. 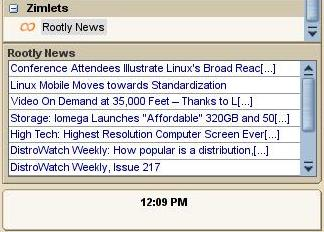 The Rootly News Zimlet also allows users to search the extensive Rootly news archive from within Zimbra displaying search results at the www.rootly.com site in a new window. The Zimlet can be activated, updated, configured or disabled with a small easy to use right click menu. The Rootly News Zimlet utilizes the customizable news aggregation services of Rootly News located at www.rootly.com. Interacting with the Rootly News Zimlet is simple. Single clicking the Zimlet will activate the news list, or update the list with the latest headlines if already activated. Double clicking the zimlet brings up the configuration dialog to customize the news list. "Preferences" opens preferences dialog for configuring custom news lists.